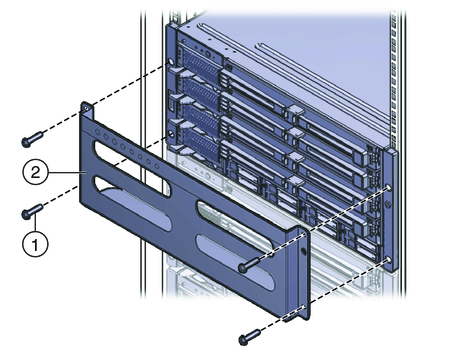 This procedure describes how to install brackets into a system equipped with the standard rack mounting kit. Note - The shipping bracket kit is shipped in the accessory tray with the rack mounting kit. See Location of the Rack Mounting Kit and the Shipping Bracket Kit for details. Remove the four (short) screws that fasten the front of the server to the rack. Insert the front shipping bracket (1) into the front of the server with the supporting flange underneath the server. 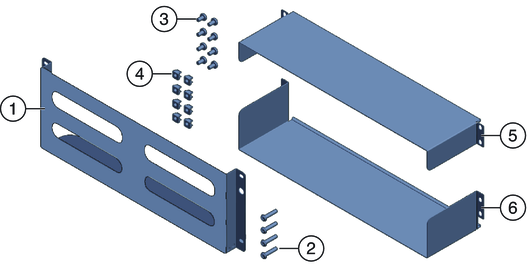 The front shipping bracket contains eight threaded holes used for storing unused screws (four M6 and four 10–32). Remove the long screws that match the threads on your rack. Use the four long screws (M6 or 10–32) (1) to fasten the shipping bracket (2) to the front of the server. Insert the short screws into the four empty storage holes on the shipping bracket. If you are installing the shipping brackets in a rack with square holes, check to ensure that the cage nuts are installed in the rear. Note the orientation and location of the cage nuts for the shipping bracket. There are four cage nuts per side (eight total). They are installed on the inside of the rack, facing outward. This is the opposite direction from the cage nuts for the shelf adapter brackets. For each shipping bracket, there should be two shipping bracket cage nuts; one in the hole directly above the shipping bracket cage nut, and one in the third hole above the shipping bracket cage nut. 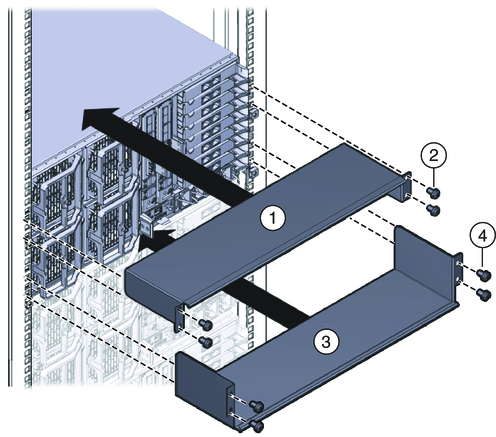 Remove the server and the mounting hardware from the rack, as described in Removing the Server from the Rack. Reinstall the adapter brackets and the server, and install the rear shipping bracket cage nuts as you install the rear adapter brackets. This is included in the rack mounting procedure. See How to Install the Standard Rack Mounting Hardware in a Rack. Insert the rear top shipping bracket (1) over the back of the server with the side panels facing down. Use four screws (2) to fasten it to the rack (4). Insert the rear bottom shipping bracket (3) under the back of the server with the side panels facing up. Use four screws (4) to fasten it to the rack.